In the last year, roughly 30 percent of all new jobs (33,922) for people with disabilities in the United States were created in the nonprofit sector. 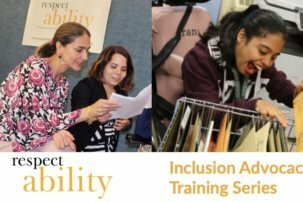 RespectAbility, a nonpartisan group working on inclusion efforts for people with disabilities, surveyed 969 people working at nonprofits and foundations, conducted five focus groups and spoke one-on-one with 14 executives at philanthropy-serving organizations. Hear what they learned and get information about what to do about it. “Disability in Philanthropy & Nonprofits: A Study on the Inclusion and Exclusion of the 1-in-5 People Who Live with a Disability and What You Can Do to Make Things Better” is an unprecedented study that everyone working on Diversity, Equity and Inclusion will not want to miss! Registration and continental breakfast starts at 8:30 a.m. and the briefing starts at 9:00 a.m. The National Press Club is located near Metro Center station and is ADA accessible. Sign language, live captions or other accommodations are available upon request. As a member of Congress from 1983-1991, The Honorable Steve Bartlett was the principal author of 18 major pieces of legislation including many legislative initiatives on advancing the cause of independence for people with disabilities. In addition to being a principal Republican author of the Americans with Disabilities Act, legislation included Medicaid eligibility, Section 1619 for Medicare eligibility, supported employment, assistive technology, creation of Towards Independence, the President’s Council on Handicapped 1984 report, and mainstreaming reforms for IDEA. During his entire tenure in Congress, he served as the ranking Republican on the Select Education Subcommittee, with jurisdiction for disability issues in education and vocational rehabilitation. Bartlett also served on the House Banking and the Education and Labor Committees. Learn more about Steve Bartlett. Jennifer Laszlo Mizrahi is the President of RespectAbility, a nonprofit organization fighting stigmas and advancing opportunities for people with disabilities. 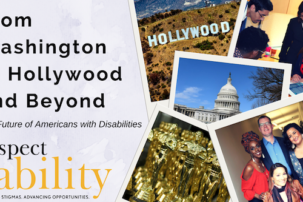 She regularly works with disability organizations, national, state and local policy leaders, workforce development professionals, media, employers, philanthropists, celebrities and faith-based organizations in order to expand opportunities for people with disabilities. Mizrahi has submitted testimony on employment for people with disabilities in all fifty states and at the Federal level. Learn more about Jennifer Laszlo Mizrahi. Aaron Dorfman is president and CEO of the National Committee for Responsive Philanthropy (NCRP), a research and advocacy organization that works to ensure America’s grantmakers and wealthy donors are responsive to the needs of those with the least wealth, opportunity and power. Dorfman, a thoughtful critic, frequently speaks and writes about the importance of diversity, equity and inclusion in philanthropy, the benefits of funding advocacy and community organizing, and the need for greater accountability and transparency in the philanthropic sector. His organization recently published the landmark equity publication Power Moves. Before joining NCRP in 2007, Dorfman served for 15 years as a community organizer with two national organizing networks, spearheading grassroots campaigns on a variety of issues. He holds a bachelor’s degree in political science from Carleton College, a master’s degree in philanthropic studies from the Lilly Family School of Philanthropy at Indiana University and serves on the boards of Capital & Main and The Center for Popular Democracy. Carly Hare (Pawnee/Yankton) has served as the Coalition Catalyst/National Director of CHANGE Philanthropy since 2015. CHANGE Philanthropy is a coalition of philanthropic networks working together to strengthen bridges across funders and communities. They are transforming philanthropy from within by building knowledge, fostering diversity, and creating connections. Carly strives to live a commitment to advancing equity and community engagement through her professional and personal life. Carly is a proud daughter, sister, auntie, partner, mother, ally, friend, and equity advocate. Carly’s Pawnee name is <i kita u hoo <i ]a hiks which translates into ‘kind leader of men’. Carly has spent her professional career navigating the intersections of philanthropy, identity, and equity. Stephanie Powers is the Vice President for Policy and Partnerships managing public-philanthropic partnerships in the Council on Foundations’ Department of Public Policy and Government Relations. The public partnership portfolio compliments the Council’s long-standing work as the policy voice for philanthropy to the Legislative Branch and ensures that philanthropy has a voice within the Executive branch as well. In her work on behalf of the Council’s membership, Ms. Powers identifies opportunities to connect foundations and government for mutual benefit, as well as leadership collaborations with national organizations that can help to advance philanthropic missions. Prior to joining the Council, Ms. Powers was the CEO of the National Association of Workforce Boards (2002 – 2006) and before that held positions in the Clinton Administration’s Departments of Labor and Education. She was appointed the National School to Work Director from 1998 – 2001 and held the positions of Chief of Staff and Director of Public Affairs in the Employment & Training Administration from 1993-1998. Kerrien Suarez is executive director of Equity in the Center, a field-wide initiative to influence social sector leaders to shift mindsets, practices, and systems to achieve race equity. A project of ProInspire, EiC envisions a future where nonprofit and philanthropic organizations advance race equity internally while centering it in their work externally. It recently published Awake to Woke to Work: Building a Race Equity Culture, which details management and operational levers organizations utilize to transform culture. Her focus on diversity, inclusion and equity developed through work with Surge Institute, Camelback Ventures, EdFuel and National Black Child Development Institute, where she supported emerging and established leaders and social entrepreneurs of color. A management consultant with over 20 years of experience, Kerrien led engagements to refine programs and scale impact for national nonprofits, including The First Tee and AARP ExperienceCorps, while at Community Wealth Partners, where she also coached grantees of the Annie E. Casey, Wells Fargo and Robert Wood Johnson foundations on issues ranging from organizational capacity and sustainability to place-based collective impact. Kerrien is a graduate of Harvard College and London School of Economics. You can follow her on Twitter at @klrs98 and @equityinthectr.